Reservations can be made by calling 216.696.8888. You may also make your reservation online. All public cruises begin boarding one hour prior to departure. If you are privately chartering the ship, please consult your sales representative for your boarding time. When is the latest I can get there? We recommend all passengers be on board at least 15 minutes prior to departure. You can board up until 5 minutes prior to our departure time. During the summer, we cruise most days. During the Spring, Autumn and Winter we do not cruise every day. Please call 216.696.8888 to check our availability. Can I just show up the day of for a seat? We are happy to sell “walk on” tickets provided we still have seats available. Our guest capacity is 330. If the cruise has sold out in advance, we will not be able to accommodate you. We strongly recommend advanced reservations. How is seating handled? Is it first come first serve? Seating is preassigned by the restaurant manager. We have tables for 8 and tables for 4. Parties may be seated together. You will be escorted to your reserved seats when you board the ship. The ticket price includes an unlimited buffet meal, the cruise, musical entertainment (all cruises feature a Disc Jockey), coffee, tea, and iced tea. Although we do not have a strict dress code, we recommend “Business Casual”. Is there a charge for parking? If so, what is it and do they take credit cards? The parking lot is located next to the Nautica Queen ticket office and lot fees range from $3.00 – $15.00. They do not accept credit cards, cash only. Is the ship handicap accessible? Is there an elevator onboard? We have limited accessibility. We can board a guest in a manual wheelchair (we cannot accommodate an electric wheelchair). The restroom facilities are up a flight of stairs. The restrooms are not wheelchair accessible. What do I need to bring with me the day of? Please bring your photo identification, the credit card you used to pay for your charges, and your confirmation number. How much is an infant? Do you have highchairs on board? Infants, under the age of one (1) are complimentary. We do not have highchairs. Complimentary tickets are for infants that will be in an adult lap. How late in the season do you cruise? We cruise until New Year’s Eve (schedule is limited in October, November & December). The DJ is always happy to announce your special day. Please speak with him while you are on board. What kind of music does the DJ play? Does he take requests? dining and then move into adult contemporary music after your meal is completed. He is happy to take requests. Is there anything on the menu for a vegetarian? We have many vegetarian options. All cruises feature a salad buffet with 5 vegetarian salads. We also offer pasta, potato (or rice), and vegetables. The route is at the Captain’s discretion and is based on weather and river traffic. The route is determined on the day of the cruise. 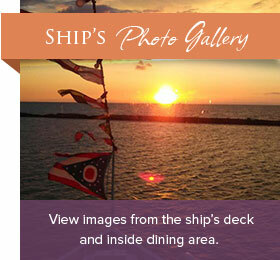 We will either cruise on Lake Erie, stay within the break wall or cruise on the Cuyahoga River. The Captain is licensed to perform ceremonies. Private charters are available or you can join us on any public cruise. Please contact group sales at 216.696.8888 for additional information. What if I miss the ship? Do I get a refund? No refunds are issued within 48 hours of the cruise. Please allow enough time to arrive at least 15 minutes prior to departure time. Cancellations made prior to 48 hours are transferable and refundable. Cancellations made within 48 hours or less may be rescheduled within the same season as purchased, but are not refundable. (Not applicable to contracted groups.) All major credit cards accepted. No personal checks accepted. We cruise rain or shine. Our dining decks are fully enclosed and climate controlled. Yes, we have both heat and air-conditioning. How soon should I book a cruise? Do you need advance notice? We recommend booking your cruise as soon as possible. Many of our cruises sell-out in advance. Friday and Saturday nights during the summer can sell-out several weeks in advance. Do you have a bar available? There is a full bar available. The ticket price includes coffee, tea, and iced tea. Soft drinks and alcohol are not included. You can purchase soft drinks and alcohol on board with either cash or credit card. Can my group have the ship to ourselves? Private charter options are available. Some charter times require as few as 75 people for exclusive use of the ship. Other cruise times require as many 300. Please contact group sales at 216.696.8888 to inquire about your date. Does the Nautica Queen accept donation requests? We receive many donation requests and are not able to accommodate all requests. If your group is selected, you will be sent a certificate in the mail within a few weeks. Didn’t find your answer? Please feel free to give us a call at 216.696.8888 or e-mail us at sales@nauticaqueen.com with additional questions.